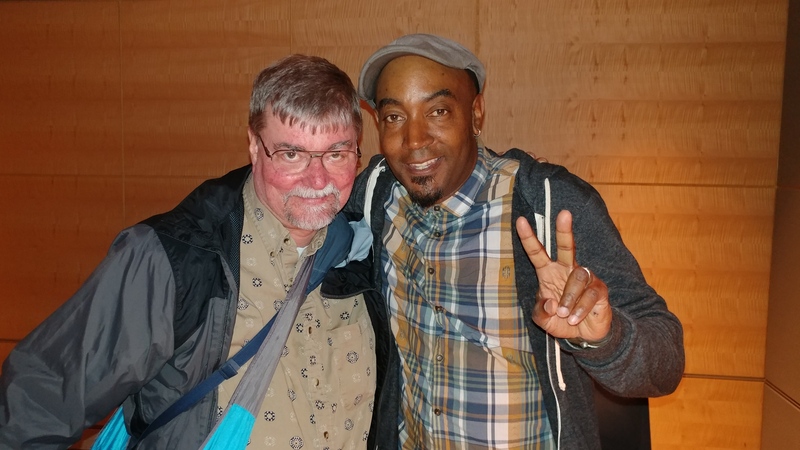 Me and Keith Knight in San Francisco! It has been a while since I had said hi to Keef (check out his K-Chronicles website here). He was in San Francisco doing his presentation on police brutality. (I wonder how Keef stays so positive and nice with such a depressing subject.) I should have done a Spider-Man web-shooting hand gesture so Fox News could say I was doing a gang sign. Go to www.kchronicles.com and see Keef’s work and buy his books! I have been a fan of Keef for what, 20 years or so? 30? It has been a while. Way back when WonderCon was in San Francisco, Keef was manning his booth and selling books, and he asked me to man it while he visited the restroom. So I stood in his booth. An older white guy came up and asked me if I was Keef. I told him I wasn’t, but I thought about it. Keef told me I should have said yes. (In this photo, I am the white guy with the glasses and the slightly droopy left eyelid.) I gave him a copy of Super Bad Hair Day and Boss by Mike Royko. I think of Keef as a writer as well as a cartoonist. He writes great little stories in his work. I still have not put Keef into a Super Holly story, but I intend to. It would be a police brutality thing, but with Super Holly and Harry Headbutt to add slapstick comedy. I would move Keef’s home town to Chicago because I know nothing about Boston. I have decided that Keef and his wifey Kerstin (or rather, the characters I create based on them) will be the parents of Tucker and Wrigley, The Puppy Brothers (hear their Malevolent Mystery Meat audio story here), BARK BARK BARK BARK BARK!!!! I can’t wait to write Kerstin’s German accent: Ack, little Schnitzels, stoppen der barking! What would be Keef’s superpower? I had thought about super-speed because Keef is the hardest-working guy I have seen in this business, and had stuck i tout for all these decades. (I have seen a lot of comic book / cartoonists come, and I have seen them go. And mostly go.) Keef once said his superpower would be the power to make people vomit (read that story here). Great seeing you again, Keef. And great hanging out afterwards at Southern Pacific Brewing and having a ginger beer and a root beer (I always stop after two drinks). P.S. Kerstin is a sweet lady. I wish I could have said hi to her also. This entry was posted in Uncategorized and tagged artist, cartoonist, gang signs, K Chronicles, Keef, Keith Knight, writer, writing by davemstrom. Bookmark the permalink.